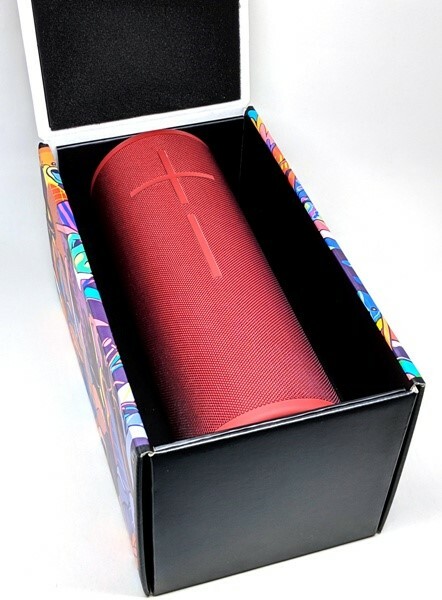 REVIEW – The new Ultimate Ears (UE) Megaboom 3 was introduced a few months ago and since I have really enjoyed using the Megaboom, I wanted to give the Megaboom 3 a try. Were there any improvements? Well, I think they did a great job in redesigning the Megaboom 3. It’s much more attractive than my previous one and also has wonderful audio quality. It also has the ability to be charged by the Power Up Charging Dock which makes charging much easier (the dock is sold separately). When testing the playing time of the speaker on low volume, I got a whopping 49 hours! Higher volume levels would decrease the playing time, which the User Guide states is about 20 hours. 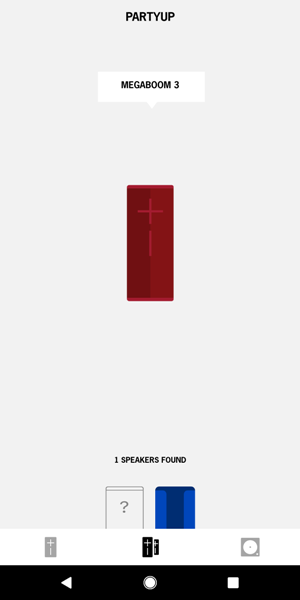 However, I did find some drawbacks to the speaker, or rather, with the app. 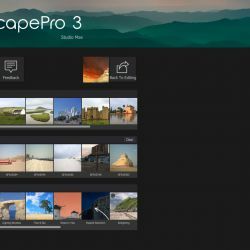 Several of the app features had problems. Sometimes they worked and sometimes they didn’t. In addition, the speaker no longer has an AUX audio port or calling features. The Megaboom 3 is the second version of the original Megaboom. It is a tough durable cylindrical portable Bluetooth speaker that provides 360-degree sound and is IP67 rated which means it can be immersed in 1 meter or 3.3 feet of water for up to 30 minutes. 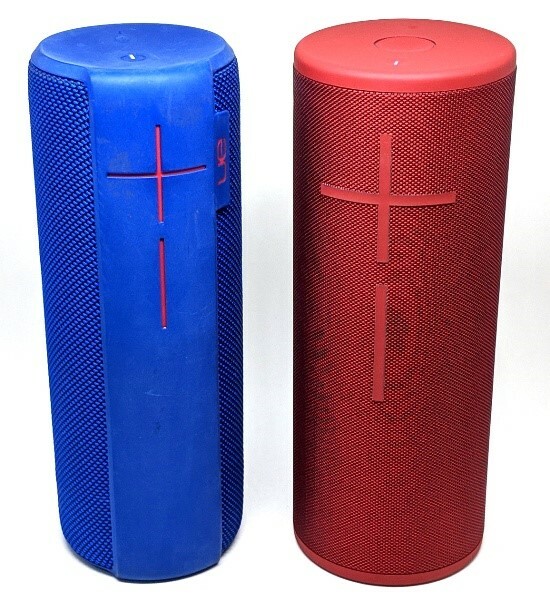 The UE Megaboom 3 (the red speaker in the above photo) received a design update from its predecessor the Megaboom (the blue speaker in the above photo). It no longer has a wide strip of silicone down the front of the speaker where the volume controls are. The top and bottom of the Megaboom 3 speaker are flat instead of concave and the mesh fabric covering the majority of the speaker is finer than that of the Megaboom. I love the red color. It has a sheen to it. The UE website calls it a two-tone “light-shifting fabric”. I think that the Megaboom 3 is a MUCH more attractive speaker than the Megaboom. Even with the differences, a couple of things remained the same. The top and bottom of the speaker still have a silicone covering and it still has the large silicone “+” (Volume Up) and “-” (Volume Down) buttons on the front. Also new to the speaker is a thin 2 cm strip of silicone running from top to bottom located on the back of the speaker. Attached at the top of the silicone strip is a tough thick nylon “Hang loop”. At the base of the 2 cm silicone strip is a micro-USB port that has a silicone cover to protect the port from water and the elements. Ha! No more having to charge the speaker on its side (the original Megaboom had its micro-USB port located on the bottom of the speaker). Also, notice the tiny circle just below the micro-USB port. That’s the LED charging status light. It’s a white light that flashes slowly when charging and stops flashing and remains on when fully charged. The top of the speaker has the following buttons (starting from the top): the Bluetooth Pairing button (the tiny circle), a new button called the Magic Button (the large center circle), and the Power On/Off button (the button that looks like a dash) each of which illuminates when activated. The bottom of the speaker has the charging dock contact located in the center. 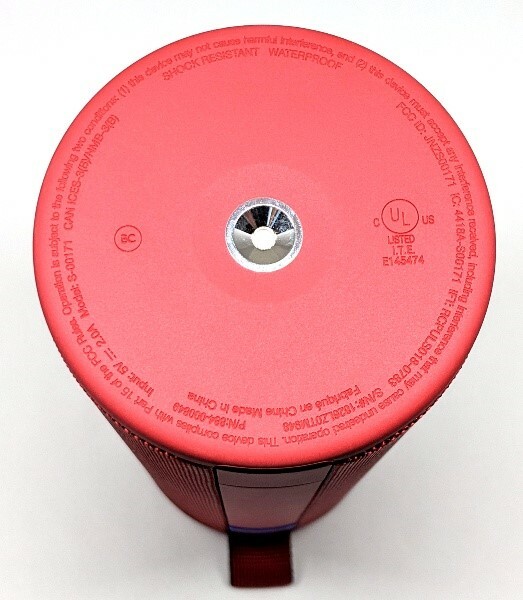 There is no longer a metal D-ring on the bottom of the speaker like that on the Megaboom. I also received the Power Up Charging Dock to review which is normally sold separately. 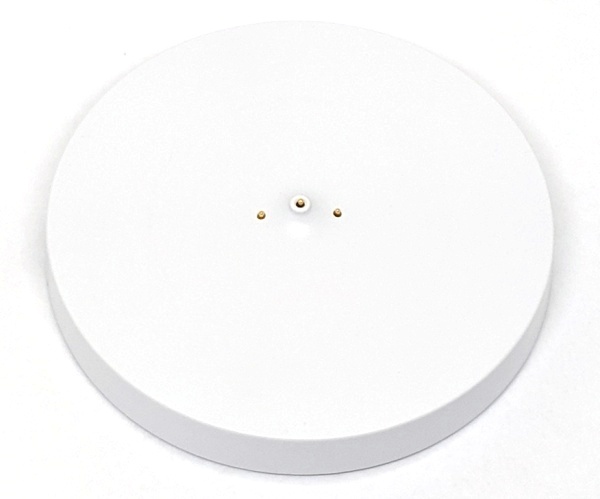 The dock is a 90 mm rigid white plastic disk that is 12 mm high (without the pins). 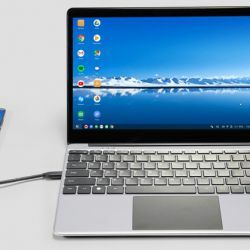 The back of the dock contains the micro-USB port. The dock does not come with a micro-USB cable or AC adapter, thus you must use the micro-USB cable and power adapter that comes with your Megaboom 3 (Blast, Megablast, or Boom 3) to plug into the dock. The front of the dock contains an LED status light. The light flashes slowly when the speaker is sitting on the dock charging. According to the documentation, the light stops flashing and remains on when the speaker is fully charged. The top of the dock contains three charging pins located in the center. 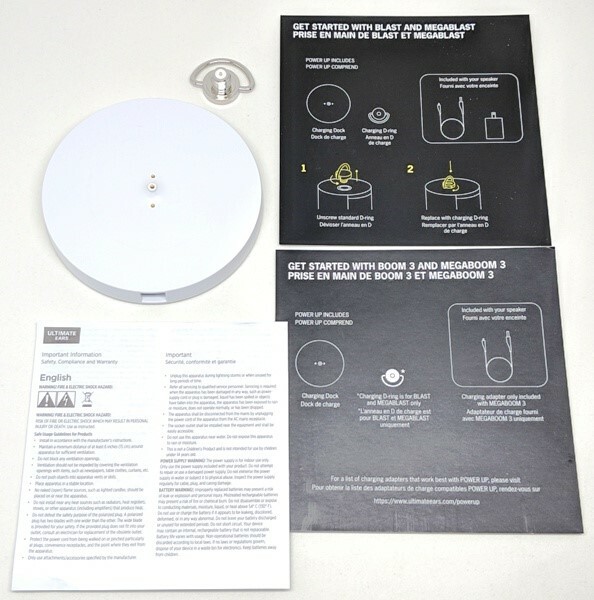 The bottom of the charging dock contains a circular rubber pad that prevents the dock from scratching any furniture that it is sitting on. 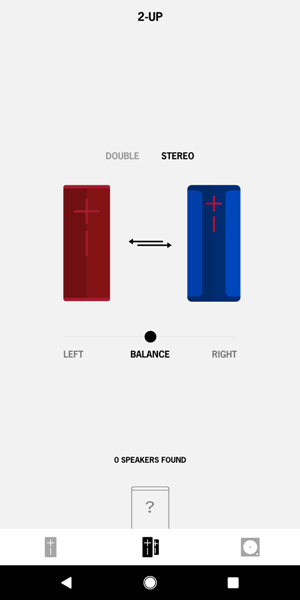 Bluetooth Pairing: To pair your Megaboom speaker with your mobile device (Android and iOS), you need to make sure that you turn on device’s Bluetooth. 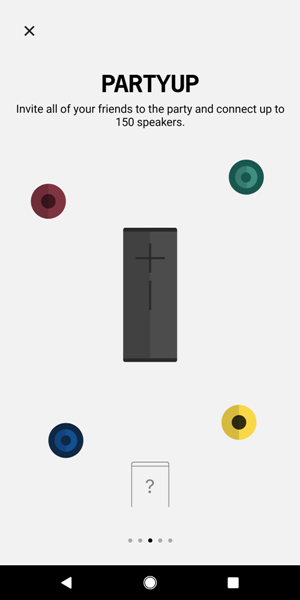 If your speaker is new, then when it is powered on, it will already be in pairing mode. 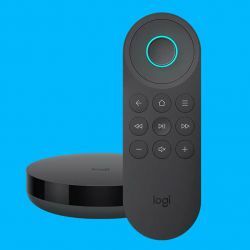 However, if you want to pair it to another device, then power up the speaker and put it in pairing mode by pressing and holding the Bluetooth button for about three seconds until you hear a series of Bongo drum beats. 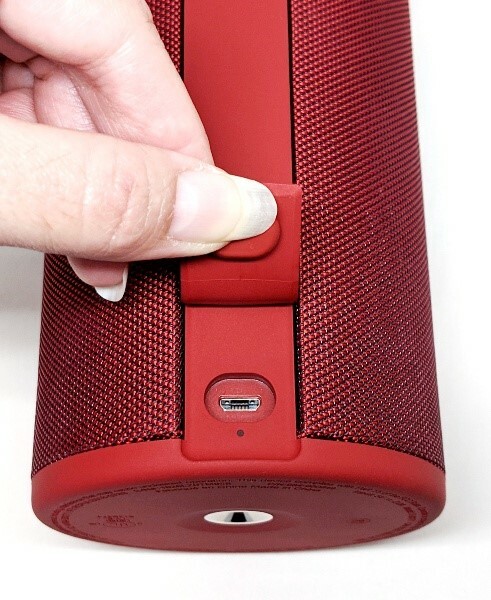 The Bluetooth button will blink rapidly when the speaker is in pairing mode. Finally, in your device’s Bluetooth settings, tap on the “Megaboom 3” in the list of discovered devices. The Megaboom 3 does not have NFC pairing capabilities like its predecessor. The speaker will remember up to eight devices and when powered on, it will connect the last device it was connected to. Ultimate Ears Boom and Megaboom app: Once you’ve paired your speaker to your mobile device, you’ll then install the Ultimate Ears Boom and Megaboom app. 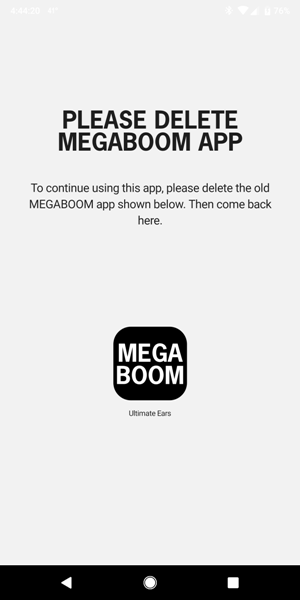 This new app now allows you to control all of your Boom and Megaboom speakers whereas, in the past, the Boom and Megaboom speakers each had their own app. I already had the Megaboom app installed on my Pixel 2 XL phone, but I was instructed to download the new app. After downloading and opening the new app, it instructed me to uninstall my old Megaboom app (shown in the left screenshot above). It is not necessary to install the app to use the speaker, but it does provide you with additional functionality. If you have multiple UE Boom or Megaboom speakers, you can choose which one you want to control with the app by tapping on the down arrow located at the upper left of the app home screen as shown in the left screenshot above. Doing this brings up another app screen that lists all of your UE Boom and Megaboom speakers (right screenshot above). Tap on the one you want, and you’ll be able to use the app to control the speaker. Then, if you want to control any of your other speakers, just go back to the list to tap on another. 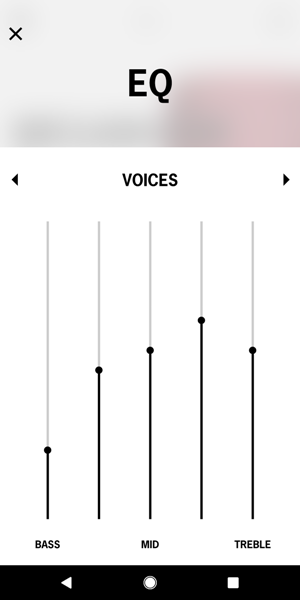 App speaker buttons: Remote power on/volume down and up/equalizer: On the app’s home screen you’ll see buttons for power, volume down and up, and an equalizer button. I could power on my Megaboom 3 speaker remotely by tapping on the app’s Power button. This sometimes worked and sometimes didn’t. And as long as the speaker was powered on, I could read the amount of battery charge left, adjust the speaker’s volume, and adjust the equalizer (EQ) settings. You may choose to use the app’s EQ presets (“The Standard”, “Cramped Spaces”, “Voices”, “Bass Jump”) or customize your own. While you can hear the differences among the presets, there were no substantial differences. Of the four factory presets, I tended to prefer “Bass Jump” and “Cramped Spaces”. I wanted to try to create my own to see if I could do better (I wanted to increase the strength of the bass). 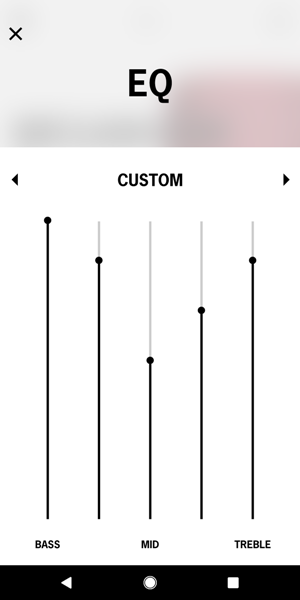 It turns out that my custom EQ did not substantially differ from the others either. There’s no real bass boost when using the EQ settings like “Bass Jump” or my own “Custom” EQ settings – just a dampening of the other frequencies (non-audiophile opinion). 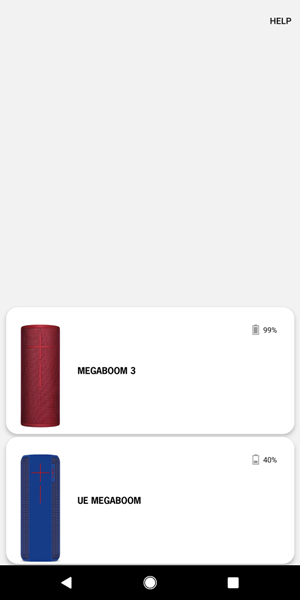 PartyUp feature: Just as you were able to connect the Megaboom to other UE speakers, so you can with the Megaboom 3. 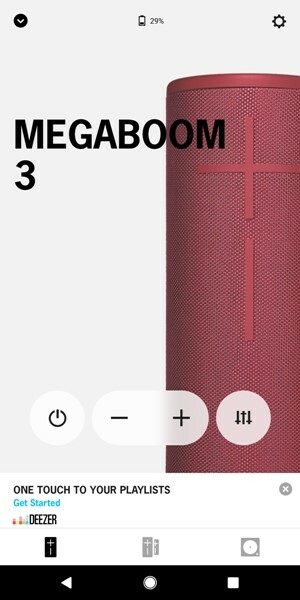 To connect the Megaboom 3 speaker to other UE speakers (Boom, Boom 2, Boom 3, Megaboom, Megaboom 3), you’ll need to use the “PartyUp” feature in the most up-to-date Ultimate Ears app. Additionally, all speakers must be using the latest firmware which can be updated in the app. To start the PartyUp process, you tap on the center tab located at the bottom of the app (the double speaker icon). On the next app screen (as shown in the screenshot above), you’ll see at the bottom of the screen in an area called the “Drawer”, “1 Speakers Found”. In the Drawer, there is a black outlined speaker with a question mark in it as well as the speaker that the app discovered which was my blue Megaboom (the app sometimes discovered my blue Megaboom even though it was powered off, other times it did not). To view a tutorial on how to “PartyUp” your speakers, you can tap on the black outlined speaker with a question mark. The tutorial steps you through the process of connecting your speakers. 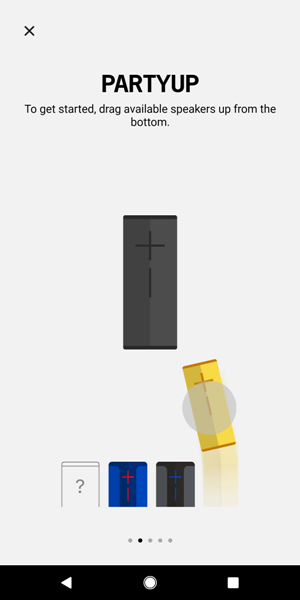 This involves dragging and dropping the speaker(s) located in the Drawer onto your currently connected speaker. 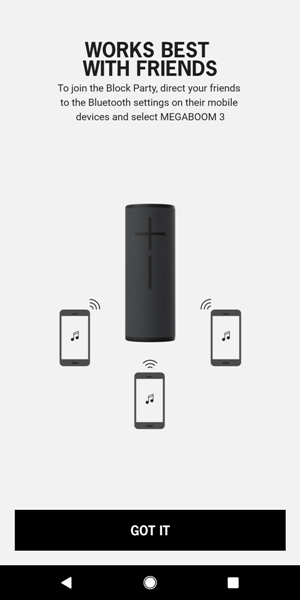 Your friends can bring their UE Boom and Megaboom speakers and connect them to yours (up to 150 speakers). And to disconnect them, you just drag a speaker back down to the Drawer or just turn the speaker off. I was supposed to be able to drag my blue Megaboom located in the Drawer and drop it right next to my red Megaboom 3 to connect them. 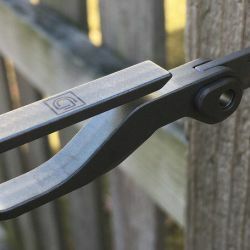 However, I had frequent trouble connecting my speakers because of the finicky nature of the app (the app features don’t always work). As I stated earlier, there were times when the app didn’t detect any available speakers for the Megaboom 3 to connect to, even though my blue Megaboom had been previously paired to my phone but happened to be turned off. 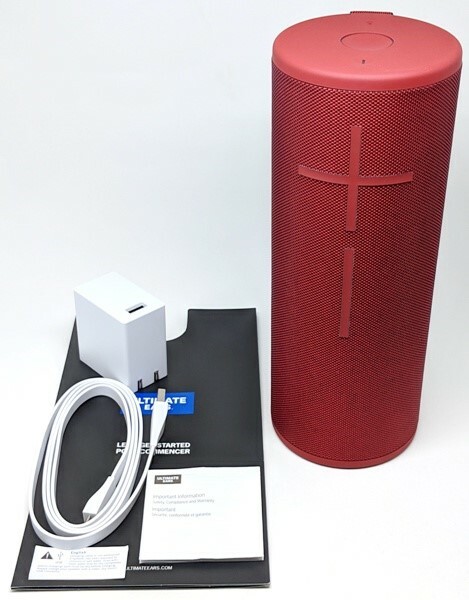 Other times, when trying to connect the speakers, I would tap on the blue Megaboom in the Drawer but couldn’t drag it up to the Megaboom 3. When I finally got them connected, they played identical streams of music. To make them a stereo pair, I tapped on the word “Stereo” above the speakers. Even after successfully making them a stereo pair, there was one time as I was playing music, the blue Megaboom just stopped playing and shut off (the battery was at 90% charge). I’m not sure if you can make a stereo pair out of a Megaboom 3 and a Boom speaker. I no longer have the Boom 2 speaker to test this. However, I know that in the past I was unable to make such a connection into a stereo pair because each of those speakers has a different sound signature. I suspect that this is still the case. Block Party feature: Using the app allows up to three people to connect to the speaker simultaneously to share their music (the Megaboom also had this feature). To start a “Block Party”, you’ll need to tap on the tab located on the lower right of the app (the circle inside a square icon). To see a very brief tutorial about how to use the “Block Party” feature, just tap on “Show me how” (as shown in the second screenshot above) which will bring up another app screen (shown in the third screenshot above). 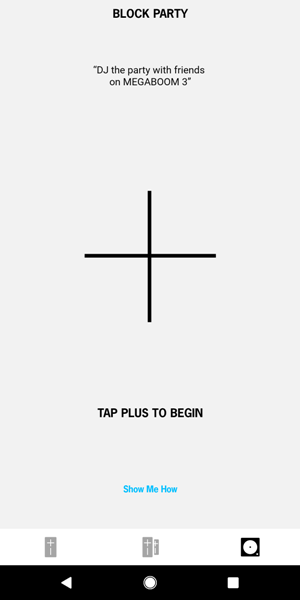 If the app works properly, all I would need to do to start a “Block Party” was to tap on the big “+” sign in the app which brings up another app screen that lists the device your speaker is currently connected to. The next step is to have two of your friends go to their Bluetooth settings and tap on “Megaboom 3” to connect to it. 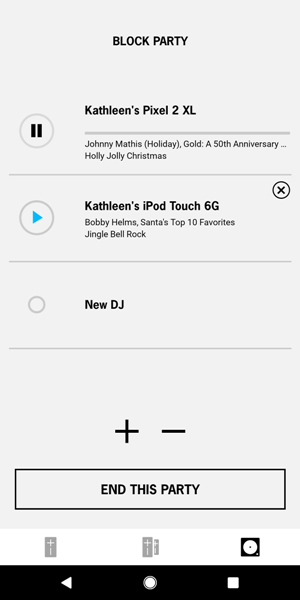 After each person has paired their devices with your speaker, you’ll see in the app that each of their devices shows up in the list indicating that they are ready to play music on the speaker (shown in the last screenshot above). There’s even a setting just under the Block Party user’s list that allows you to change the Block Party DJ by tapping on “New DJ”. The DJ is the person who has the power to play, pause, or adjust the volume of any Block Party user’s music. Setting up a Block Party sounds easy if the app works correctly. There was one time when I tapped on the big “+” sign to start a Block Party but the other app screen containing the list of Block Party users never popped up. Another time, as the DJ, I tried to tap on the “Play” button next to various Block Party users and it failed to play. And yet another time, when each of the devices was playing, the connection was intermittently dropped thus interrupting the music multiple times. As I just stated, the Block Party host or “DJ” has the power to adjust the volume or pause or play any user’s music. However, each person can adjust the volume of the speaker as long as that person is actively playing music through it. It is also possible to interrupt each other’s music by any of the users tapping on the play button in their music apps. So “play” nice!! To remove a Block Party user, you only need to go into the app and tap on the “x” which is located to the right of their device’s name. NOTE: You cannot use the “PartyUp” feature simultaneously with the “Block Party” feature. Speaker Settings: You can access the speaker settings by tapping on the gear icon located in the upper right of the app home screen. 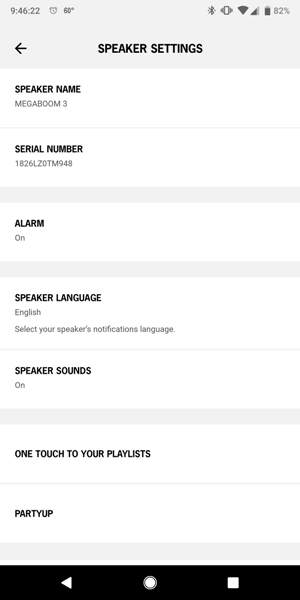 Here you can change your speaker’s name, change the speaker’s language, turn on or off the speaker tones (those that indicate pairing, power on/off, maximum/minimum volume reached), and set up “One Touch to Your Playlist”. 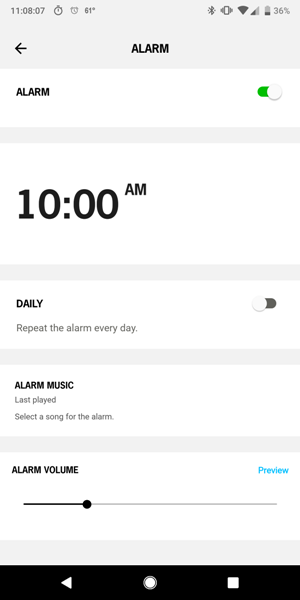 Alarm: Using the app, you can also set an alarm on the speaker. Under “Alarm Music”, when I selected “Last played”, I could not get the alarm to play Pandora music even if Pandora was still running in the background. I then tried to set the alarm using Amazon Music as the last played music. I also tried using Google Play Music. These didn’t work either. I was hoping the “Last played” setting would work because I keep very little music on my phone and mainly listen to music streaming apps. However, I was able to get the alarm to play a song stored on my phone. When the alarm went off, the volume started off very quiet and increased slowly to the level that I set in the alarm settings. And if I didn’t turn off the alarm, it played the same song again. If I snoozed the alarm, it went off again in 10 minutes. PartyUp settings: Also in the Megaboom 3 speaker’s settings, I could change the “PartyUp” settings. Turning on “Sticky PartyUp” “enables your grouped speakers to play together whenever you are ready to party”. It seems that this feature is supposed to allow you to keep connected speakers connected. However, my experience was that when you turn off the speakers and then turn them back on, they were not connected. 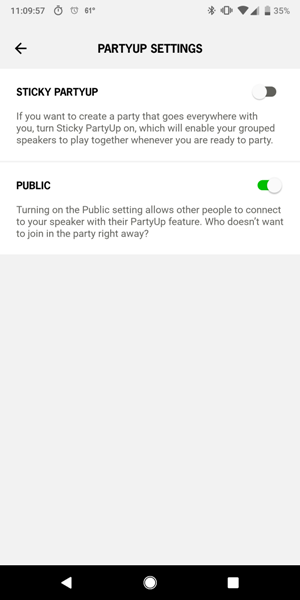 And turning on “Public” “allows other people to connect to your speaker with their PartyUp feature”. Charging Time: I couldn’t find any documentation that states how long it takes to charge the Megaboom 3. 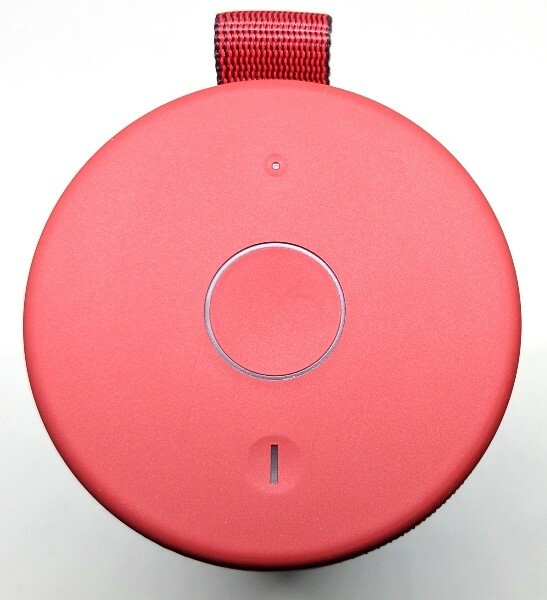 The speaker’s Power button’s LED light initially shines a white light when the speaker is on and the battery has enough charge, but when the battery gets low, it shines red and then flashes red when the battery is just about to die. When charging the speaker by plugging in the micro-USB cable into the micro-USB port on the speaker, I found that I was able to charge the speaker in about 2.5 hours. However, when charging the speaker using the Power Up Charging Dock, I found that it took about three hours to charge the speaker. Thus the charging dock is great for easy charging but it does seem to take longer to charge the speaker. To determine the amount of charge on the speaker, you must simultaneously press the big “+” (Volume Up) and “-” (Volume Down) buttons on the speaker and a voice prompt will inform you what the battery level is. Playing Time: The UE website states that the Megaboom 3 speaker will play music for about 20 hours on one full charge of the battery (depending on how you use the speaker). I was able to play music on the speaker at a low volume level for a whopping 49 hours before the speaker shut off. I used the speaker to provide background music during the day so the playing time seemed to last forever. If you use it at a mid-volume level or higher, you’re likely to get a lot less playing time. Magic Button controls: The Megaboom 3 has a new button – the Magic Button. This button can be used to control the music that you are playing from any music provider. You can play/pause (single press of the Magic Button) and skip tracks (double press of the Magic Button). These worked well for me. The Magic Button can also directly access a playlist – but only from Apple Music (iOS only) and Deezer Premium (Android only). 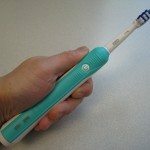 If you happen to use one of these, then you’re in luck (I don’t use either of these). You’ll need to use the app to guide you through the steps to select your playlists. After that is completed, you can play your first playlist by long pressing on the Magic Button for 2-3 seconds or skip to the next one by long pressing the Magic Button for another 2-3 seconds, etc. There is no limit on the number of playlists you can select. You can play/pause your music (single press of the Magic button) or skip tracks (double press the Magic Button) as well. Since I don’t use either of these streaming services, I didn’t test this. Auto Shutoff: If the Megaboom is powered on and has been idle for 15 minutes, it will automatically shut off. Bluetooth Connectivity and Range: The specifications for the Megaboom 3 state that the Bluetooth range is 150 feet. I was able to go about 107 feet in line-of-sight of my Pixel 2 XL before the connection started to drop. However, when using an iPhone 7, I was able to reach a distance of over 150 feet in line-of-sight of the iPhone. Also, when testing connectivity, I found that the speaker maintained Bluetooth connectivity with my Pixel 2 XL and iPhone 7 even through four walls. Waterproof feature: The Megaboom 3 is IP67 rated and is thus can be immersed in up to one meter of water for up to 30 minutes. 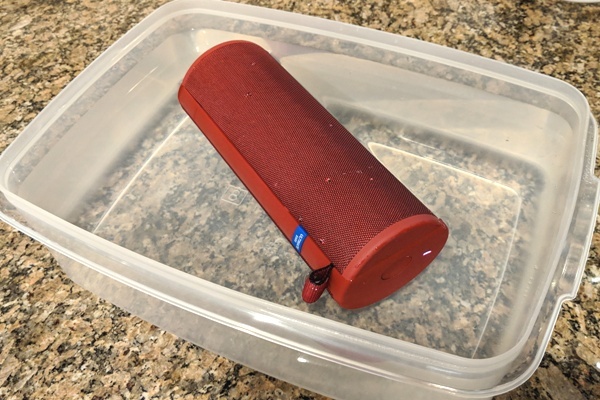 I placed the speaker in a Rubbermaid container filled with water for about 30 seconds or so and it continued to play music (this is the same test I did on the blue Megaboom). 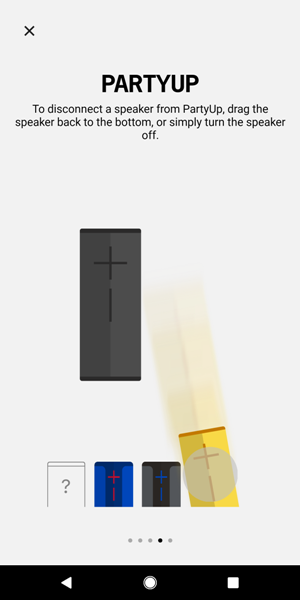 I also noticed that it floats. 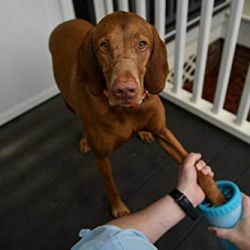 NOTE: According to UE, “If the speaker has been exposed to chlorine or salt water, rinse with fresh water and air dry completely before charging”. 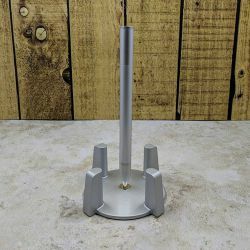 Rugged and Durable: According to the UE website, “We put it through more than 25 rigorous durability tests including 1000s of button pushes, tumbles, drop tests and more. 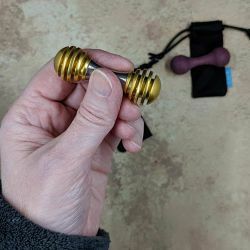 You can drop it, kick it, headbang with it, even spill your drink on it, and your MEGABOOM 3 speaker will take it all like a champ.” I have no intention of doing any drop tests, but it sure is nice to know that if I accidentally drop the speaker, it could handle it. Frequency Range: The specifications indicate that the speaker has a frequency range of 60Hz-20,000Hz. 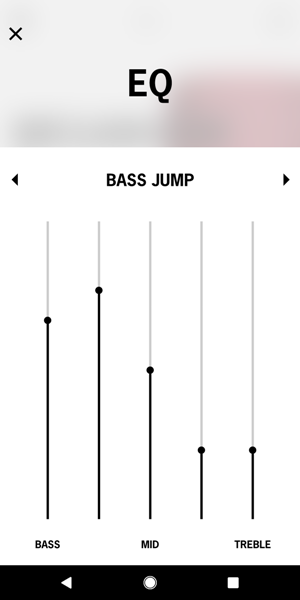 Using a tone generator app on my phone, I found that the bass does indeed go as low as 60Hz. But since I can’t seem to hear any frequencies above 16,000Hz, I leave it to the rest of you to listen for those frequencies. Audio Quality: The audio quality of the Megaboom 3 is really quite good for a speaker this size. 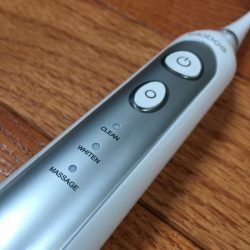 Just like the Megaboom, I thought that all frequencies were clean, clear, and well balanced. Listening to “High Roller” by The Chrystal Method and “Salute” by Little Mix both of which have some really deep bass, I noticed that the Megaboom misses that deep bass, but the songs still sounded pretty good. And because it is Christmas time, I listened to “Greensleeves” by the Vince Guaraldi Trio in which the music is soft and soothing and seemed well balanced. When listening to “Triumph” by Audiomachine, all the instruments/vocals were clear and powerful. 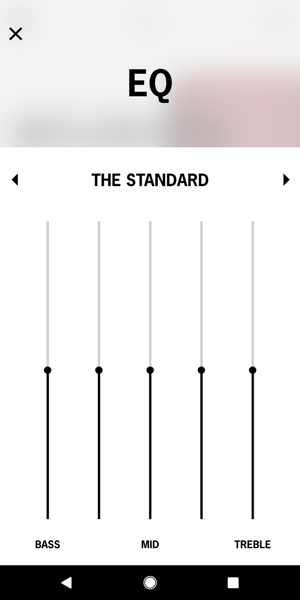 I also listened to “Siúil a Rún (Walk my Love)” by Celtic Women/Lisa using the “The Standard” EQ preset which was quite beautiful, highlighting the singer’s lovely voice without dampening the bass of the accompanying music. And “Night Moves” by Bob Segar was also well balanced and enjoyable to listen to. What’s missing from the Megaboom 3 that the Megaboom had? 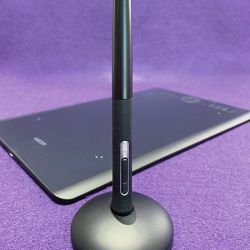 There are no more gestures (tapping on the speaker to play/pause music), no NFC pairing, no AUX audio port to physically connect a mobile device to play music, and there are no calling features. I love the new design: less silicone on the body of the speaker, finer mesh fabric covering, beautiful color, easier access to micro-USB charging port. The Ultimate Ears Megaboom 3 is a very nice speaker. 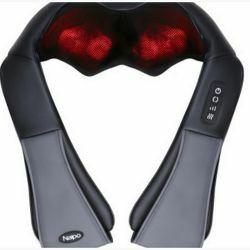 The audio quality is wonderful and I truly enjoyed listening to music on it. The audio is crisp and clear when listening to all genres of music. In addition, the Megaboom 3 is so much more attractive than its predecessor. The redesign is excellent – I love the finer mesh fabric around the body of the speaker, the fact that it has less silicone, the flat top and bottom, and the micro-USB charging port on the side of the speaker instead of on the bottom. It’s also very durable and waterproof too. 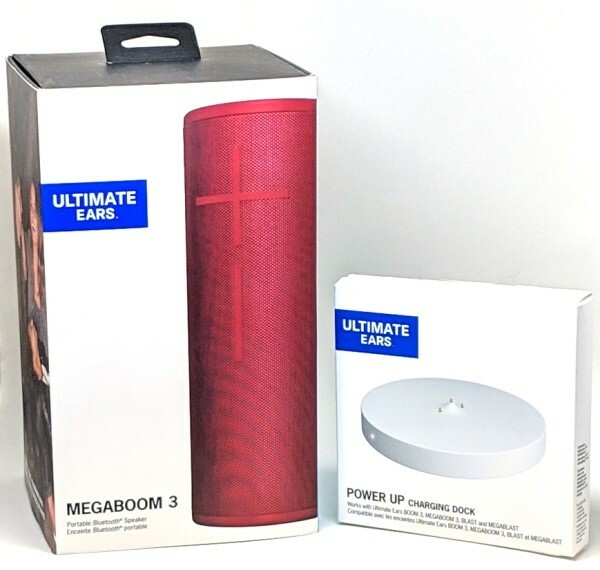 The Ultimate Ears Boom and Megaboom app allows you to connect it to other UE Boom and Megaboom speakers that will play identical streams of music or make them a stereo pair (PartyUp feature). In addition, you and two of your friends can connect to the speaker simultaneously to share music (Block Party feature). However, the app has some issues. The remote power on feature didn’t always work. Sometimes the PartyUp feature did not find my speakers to connect them. And one time, when they were connected and playing music, one speaker just stopped playing music and turned off. The Block Party feature also had some problems where the connected devices had connectivity issues thus resulting in the music stuttering. 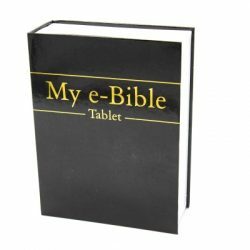 There are also a few other things that may make you hesitate to purchase the Megaboom 3. It no longer supports calling features, it lacks an NFC pairing feature, and it lacks an AUX audio port. And finally, is the Power Up Charging Dock worth the added expense ($39.99)? Possibly depending on what’s important to you. It certainly makes charging the Megaboom 3 MUCH easier (which I love), but it does seem to charge more slowly than directly plugging a micro-USB cable into the speaker. Another consideration is that it can only be used with Blast, Megablast, Boom 3, and the Megaboom 3 speakers. 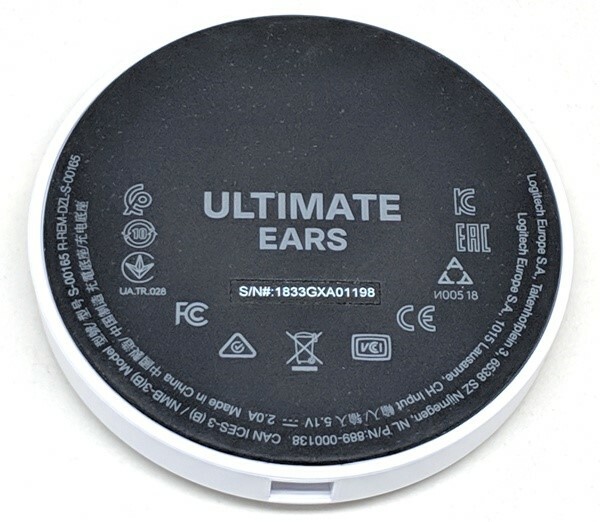 Source: The sample of this product was provided by Ultimate Ears.